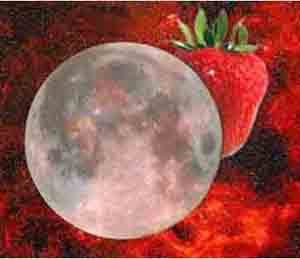 Full Strawberry Moon is also called Rose Moon or Flower Moon. Called the Full Strawberry Moon in our area because the strawberries are ready to be picked. It is one of the first harvests of the year. Like strawberries we start to see the fruits of our labor. This is a good time to focus on the seedlings that have started to really grow. In my personal life, my son is nearly ready to graduate but needs a little bit more focus to keep him going so he too can accomplish what his goals are. I continue to focus on building my therapy practice by networking and am starting to see some positive growth. * I have been eating a bit better and I walked my 1st 5K ever on the NAMI Walk on April 27. * My son finished his senior project and looks to graduate high school on time. He also may finish his Eagle Scout project and he will go to China right after he turns 18 for a couple of weeks with his choir.